An attractive single family housing community located between Dillon and Keystone Colorado. 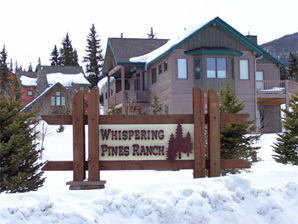 Whispering Pines Ranch Road provides access to 11 side streets and the homes & lots in the community. Greenbelts and paths border homes and provide access to the nearby forest area. Common area landscape maintenance, upkeep of the neighborhood park and trash service are among services provided by the Association. Homeowner dues are billed annually and trash collection is billed semi-annually. The Board of Directors will meet in June. Date and agenda will be posted when determined. The annual meeting will be held on Saturday, October 19, 2019 at 9:00 am at the Keystone Fire Station.